Walking in France, the Alps or Pyrenees, you will see herds of sheep or goats. Maybe you will see a shepherd with them, part of a timeless tradition. You are walking along a path enjoying being out in the mountains. Up ahead there’s a flock of sheep. As you approach you suddenly hear barking and a large dog running towards you. What do you do? Stop! The dog thinks that you are a potential threat to the flock. It coming to find out. Don’t run! The temptation is to run away but this will only increase the likelihood that the dog will run after you. My experience is that if you stand still they will come quite close (5 to 10 metres) and bark furiously but then not come any closer. Stay still! Keep your arms down by your side. If you’ve got walking poles don’t wave them around as this will be seen as a threat. Avoid making direct eye contact with the dog. Stay calm & wait! (calm at least outwardly). The dog will take a few minutes to decide that you are not a threat. It will gradually calm down and may then wander back towards the flock. Move slowly away from the dog and the flock. If the dog starts barking again stop. If the flock is blocking the path go around (if the terrain allows) rather than “force” your way through the middle. In the Alps they are known as “Patou” however they are perhaps more commonly known as Pyrenean Mountain Dogs. They are large, 60 cm or so at the shoulder, with a long white coat. They make good guard dogs as they are loyal to what they see as their “family”. The dogs are brought up as puppies with the flocks and then come to see them as part of their family. They are very protective. Why are these dogs there? To protect flocks from various predators including the increasing population of wolves farmers use guard dogs, patou. These dogs stay out on the mountains with their flocks day and night. Their use is largely due to the increasing population of wolves. There are regular wolf attacks reported in the local papers and farmers are understandably taking measures to protect their flocks and their livelihoods. One of the ways is through the use of patou. Wolves have spread over from Italy in particular. 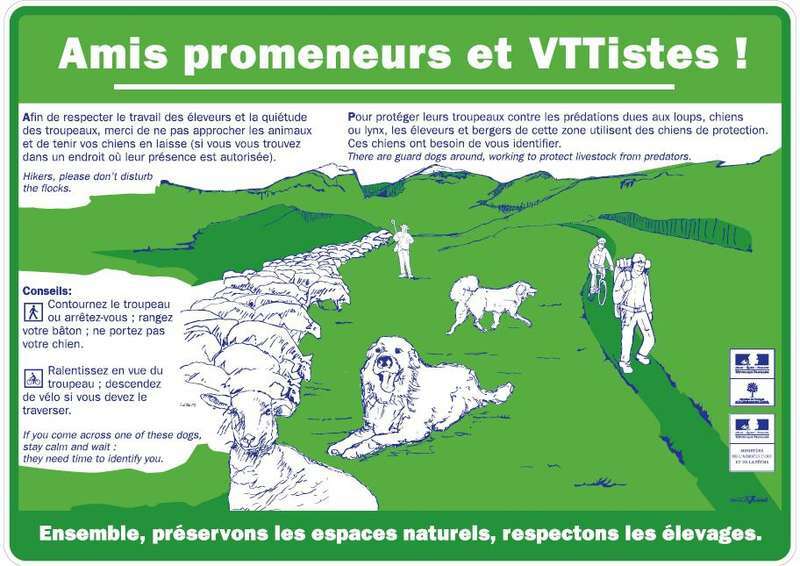 The wolf is a protected species under the Berne convention and to kill them needs an authorisation from the local prefet.